Dr. Marchetta is the founder and President of Obstetrics and Gynecology of the Reserve as well as The Spa at Yellow Creek. He is a native of Akron and achieved his undergraduate degree at Northwestern University. He continued his education at The University of Cincinnati College of Medicine and returned to Akron to complete his residency training in Obstetrics and Gynecology at Akron General Medical Center. Always at the forefront of technology and innovation, Dr. Ross Marchetta is one of the most respected & sought after surgeons in Northeast Ohio. He began his practice in 1990, focusing only on patient care and results as opposed to patient volume. This attitude helped create a difference in patient care, eventually expanding into three busy locations in Bath, Hudson and Green. 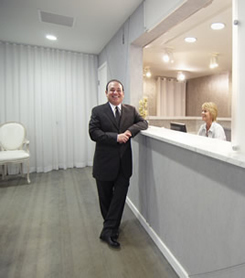 To further innovate patient care and the healthcare industry, Dr. Marchetta opened an integrative healthcare spa in 2005 (The Spa at Yellow Creek) to contribute towards preventative medicine for his patients and also to provide a valuable wellness resource to his hometown. As technology in healthcare advanced, Dr. Marchetta was chosen to run an Intuitive Surgical Robotic Epicenter due to his overwhelming success, becoming a benchmark for patient care and surgical protocol. There, he trained physicians on the latest robotic surgical procedures, standards and best practices. Dr. Marchetta is an accomplished laparoscopic and vaginal surgeon and a fellow of The American College of Obstetricians and Gynecologists. He is a member of the Society of Laparoscopic Surgeons and the AAGL. He performs minimally invasive surgery for Endometriosis, Fibroids and Hysterectomies. He is trained in the latest techniques including the da Vinci Robotic System. Dr. Marchetta has lead a daVinci Robotic Epicenter where he trained international surgeons on minimally invasivn surgical techniques and also travels the country speaking at various conferences & to different medical groups about the latest technology in robotic surgery. Dr. Marchetta is credited with being one of the top robotic surgeons in the country.